“I didn’t have a dad,” Chris says. Although he lived with his mother and sisters, “I was really alone… I had no one to talk to.” Without his father in his life, he grew up with a sense of abandonment… of rejection. When, at age 10, he was abused by someone he trusted, his sense of isolation grew even more severe. Still a child, he began to numb his pain with alcohol. 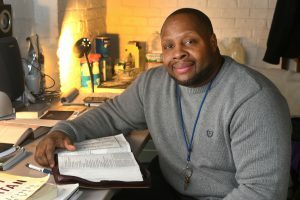 As he grew older, he became immersed in the street life – drugs, gangs, unhealthy relationships – whatever it took to ease the void in his heart. By the time he became a man, his destructive behavior dominated his life. He tried different treatment programs, but they never touched the heart of his misery… the wounds he suffered as a child. “I recall people telling me, you really, really need to come to Jesus,” Chris says. Finally, at Bridgeport Rescue Mission, he did. Today, Chris says his time at the Mission saved his life, and his heart is filled with thanksgiving for friends like you who helped provide this life-changing opportunity. “Now I’m going to do as God says,” Chris shares.